Congratulations to Gary Tam and co-authors for their Best Paper Award at VAST 2016: An Analysis of Machine- and Human-Analytics in Classification, Gary K. L. Tam, Vivek Kothari, Min Chen, http://dx.doi.org/10.1109/TVCG.2016.2598829. 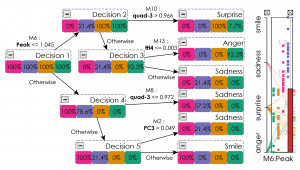 In this work, we present a study that traces the technical and cognitive processes in two visual analytics applications to a common theoretic model of soft knowledge that may be added into a visual analytics process for constructing a decision-tree model. Both case studies involved the development of classification models based on the “bag of features” approach. Both compared a visual analytics approach using parallel coordinates with a machine-learning approach using information theory. Both found that the visual analytics approach had some advantages over the machine learning approach, especially when sparse datasets were used as the ground truth. We examine various possible factors that may have contributed to such advantages, and collect empirical evidence for supporting the observation and reasoning of these factors. We propose an information-theoretic model as a common theoretic basis to explain the phenomena exhibited in these two case studies. Together we provide interconnected empirical and theoretical evidence to support the usefulness of visual analytics. This entry was posted in Best Paper, IEEE TVCG, Prize on October 24, 2016 by Mark.